With the impending arrival of new monoethylene glycol (MEG) capacity, there is a risk of oversupply from 2020 and beyond. 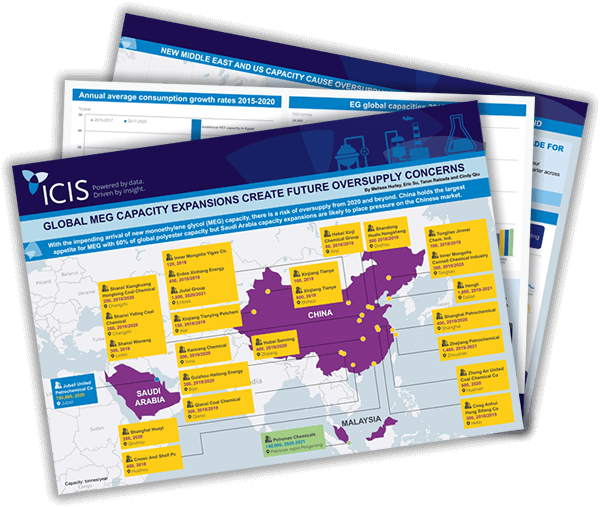 This ICIS infographic examines the forthcoming arrival of new capacity in the US, Middle East and Malaysia and the likely impact on global trade flows in the next few years. China is the likely destination for additional MEG output, with the largest appetite for MEG due to 60% of global polyester capacity, but Saudi Arabia capacity expansions are likely to place pressure on the Chinese market.